by John H. Roush, Jr. The remembrances of a hunter, soldier, and fisherman. 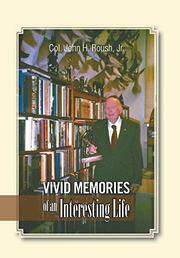 In this memoir in essays, Roush (World War Two Reminiscences, 2013, etc.) sweeps readers through his 93 years, telling tales of adventure, wonder, endurance, and personal connection. He hooks steelheads on the Klamath River in Northern California, survives pernicious lymphoma, encounters some of the world’s most dangerous animals while hunting, and, as a young man, leads a U.S. Army infantry platoon during World War II. Stories of hunting trips abound, but he says that “most of it has been without firing a shot, just looking to see what is to be seen of nature.” Born in Portland, Oregon, in 1923, Roush’s earliest memories center on his maternal grandmother, Mary Anna Reuter Schuster. On the day of her funeral in 1930, he says, he had a vision of her alive and well in the living room, rocking in her usual chair. Indeed, several stories highlight how such unusual events often occurred in Roush’s life: “Saving a man’s life is a unique experience for most people,” he writes, “yet I have rescued three men from drowning in Tahoe alone.” The last of these rescues was particularly mysterious: Roush says that an inner voice sent him out fishing that morning, promising him the biggest catch of his life. Later, while hunting in South Africa, a local soothsayer foretold the possible death of the author’s wife, Virginia; she did become seriously ill but thankfully survived another 20 years. Some of the most touching, heartfelt passages here show Roush’s obvious love for his spouse of 65 years. Readers may wish that they heard more about the author’s children, but there’s so much material here, in more than 100 essays spanning six continents, that perhaps it’s asking too much to ask for more. At one point, for instance, Roush describes being a witness to his cousin’s post-traumatic stress disorder; the author says that a friend persuaded him to write the chapter—and that friend was right to do so, as it’s one of this collection’s most timely chapters. A set of engaging stories by a man who’s lived life to the hilt.